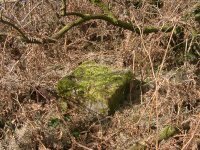 We became aware that during the war, there had been a 'Decoy Airfield' laid out on the ground near the Village of Clearbrook. We don't know who drew the map below, but it seems to be a pretty accurate representation as some remnants have been found. I am indebted to Dr Ian Bentley for the historical notes below and some of the photos. 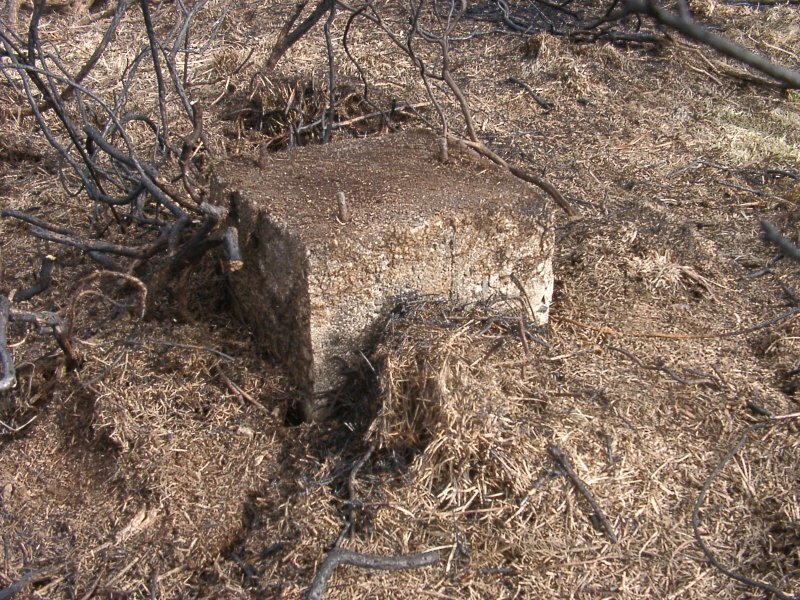 March 2006: After some more surveying, we have discovered that runway light base 17 doesn't sit on the same alignment as Nos 18/20/22!! It is about 12 feet to the right. This makes tracking the bases on the other sided of the road even more difficult! After some burning took place in the area, we went back to see what might have been revealed. We discovered that runway light base 3 was right under our noses all the time! We must have walked past it dozens of times! But that's the fun of this game. Search for hours, find nothing, then as you stand talking about going home, you suddenly find what you've been looking for is at your feet! Which is EXACTLY what happened on the 15th April. A small additional search then located runway light base 1 in the burnt area. 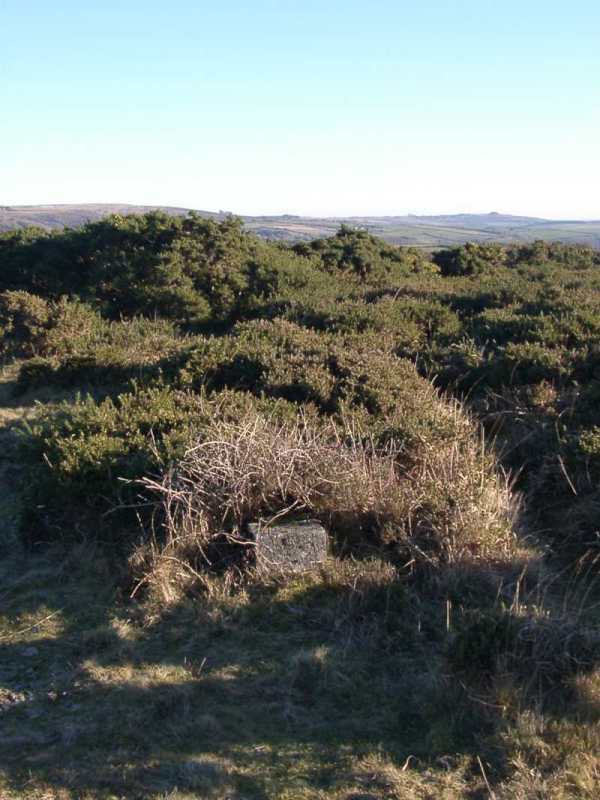 We then found Obstruction light 25 standing in a cleared area of gorse, just a short walk from the main A386! Clearance work continues to take place around the two leats and this does reveal more of our bases as a consequence. A further search in March, found three 'missing' bases that we had previously failed to find despite several searches. Base No.9 was revealed after a fire in the area and shortly after that, we found Base No.10 in an area we had searched before! 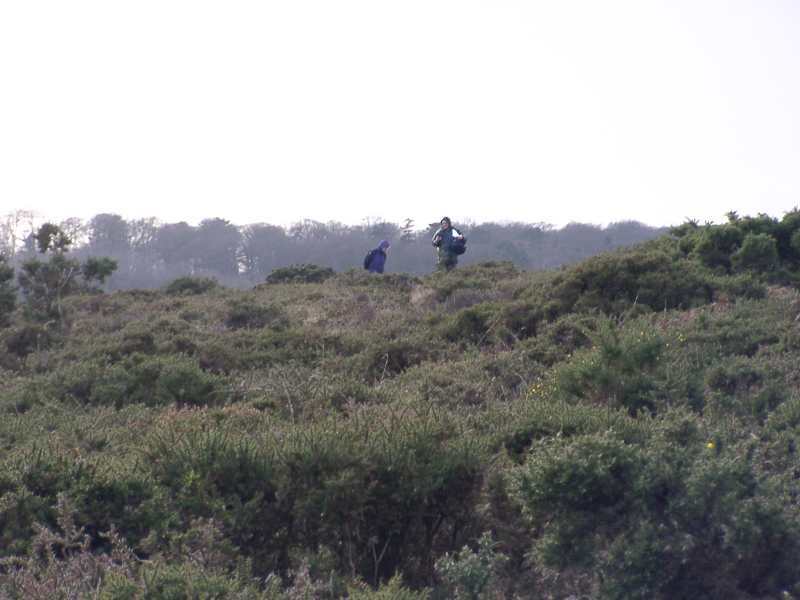 That same afternoon, for no apparent reason, I wandered beyond the car park (where we thought Base No.8 should have been) and almost immediately, spotted No.8 sitting under a gorse bush!!!! However, Bases 14, 15 & 16 continue to defy us by remaining hidden. 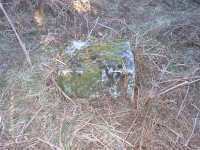 We also think that Base No.27/28 has been removed as we can no longer find it. There are two Bases currently lying in the bed of the leat near the overbridge which we are trying to arrange to get replaced in their holes. This is no easy task as they are very, very heavy! Base No.24 was also discovered, not quite where we thought it would be on the map. It is actually right alongside the A386 in a clump of trees, about six feet from the fence. You can actually see it from the road as you drive by, once you know where it is that is! March 2014: Not much has happened since 2012. However in the last month or so things have looked up! 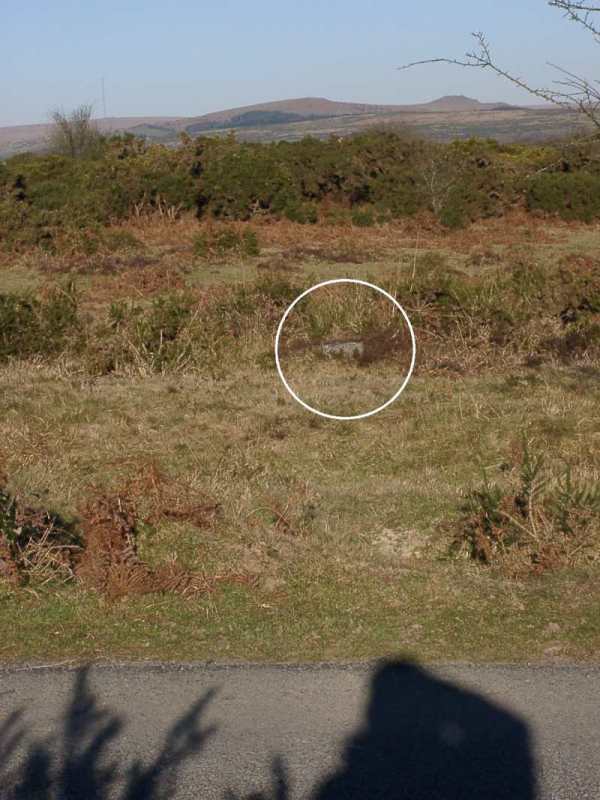 It now appears our decoy site was one of NINE such sites around Plymouth. 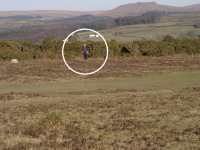 See a forthcoming Dartmoor Magazine for the whole story. In the meantime....clearance has revealed Lightbase No.16 at last. It is badly damaged but at least we've found it. There is no sign of Lightbase No.14 and we fear it has been removed sometime in the past. Still haven't found Nos 13 & 15. 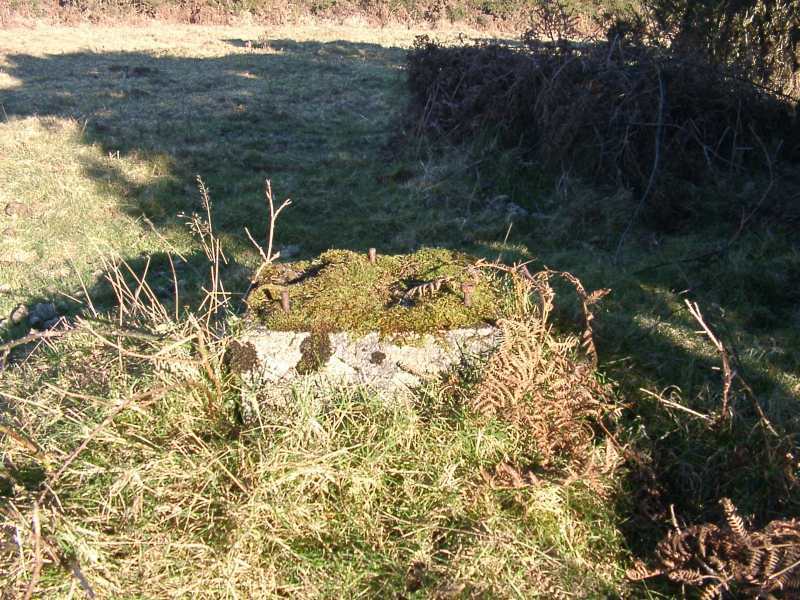 At the other end of the site, Lightbase No.5 has finally been found! This means that if we can re-find No.4, then this lower 'runway' is complete. 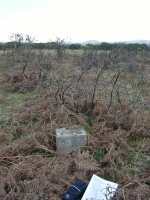 Sadly, more bases have been damaged by gorse clearance work. Nos 7, 11, 12 & 23 have been uprooted. Nos 2, 10, 16 have been pushed over. We haven't checked the top end (Nos 17 on to 21) recently. There are plans to relocate the 'uprooted' Lightbases. This work will be done as soon as practical. Not easy as they are VERY heavy. We know because we tried to shift the ones in the leat! March 2015: Further damage has been done to more posts. But on the plus side, we have repaired No.16. The layout of the decoy airfield, placed over the 1906 map of the area. Each element of the site has been numbered and is referred to below. Runway light base - Found! Runway light base - Not found still!!!!!!!! 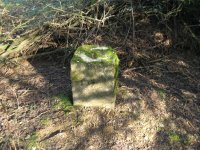 Obstruction light base - maybe found? Obstruction light base - Found? Obstruction light base - removed? N.B. If you decide to go looking for items no 18 to 21 & no 30 - note that they are alongside the fairway of the local golf course. 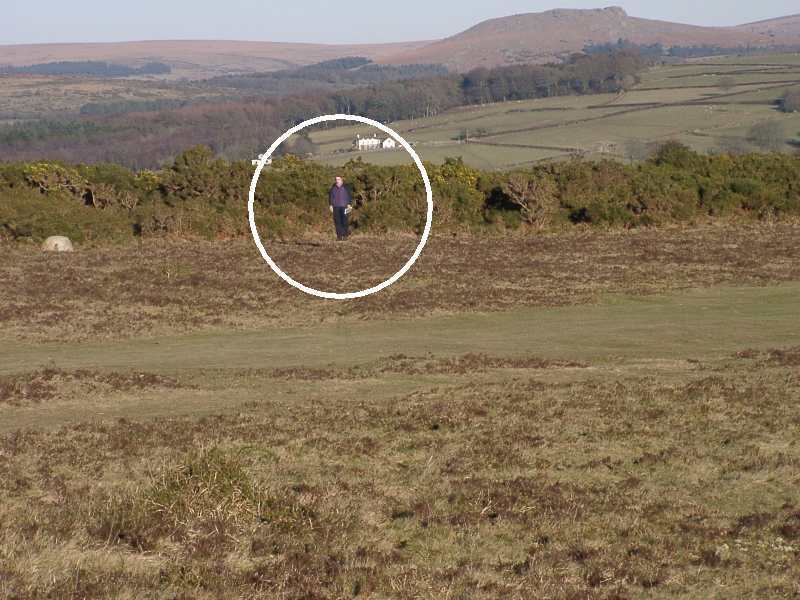 Be aware of golfers and do not wander across the fairway if they are on the tee! These two "Obstruction Light" posts are close together. One can easily be found above the car park but not the other! So which one is anyone's guess! 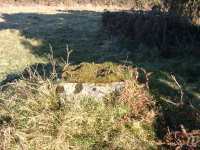 This runway light post is not in the bed of the leat as first thought, but is a few yards further away. 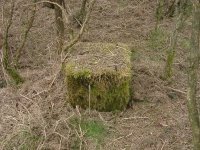 The block in the leat may have been the base for a fence post? of No 7. 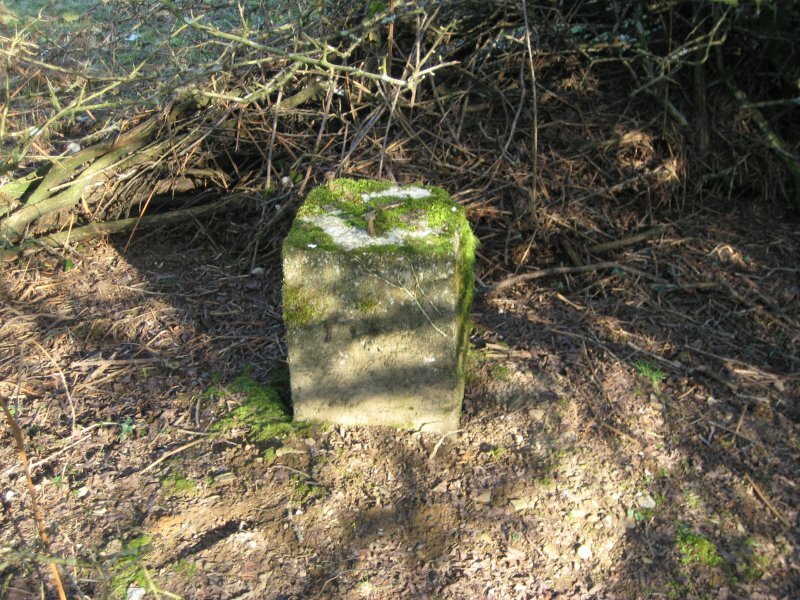 These two plinths (6 & 7) are the next easiest to find after No 12. This shows how close this is to the road. 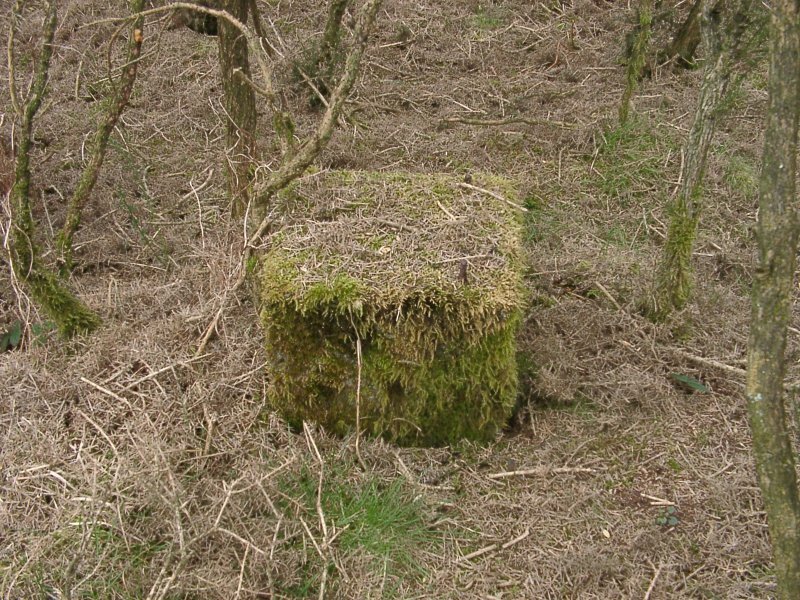 Probably the easiest one to find if you actually want to see one of these plinths. 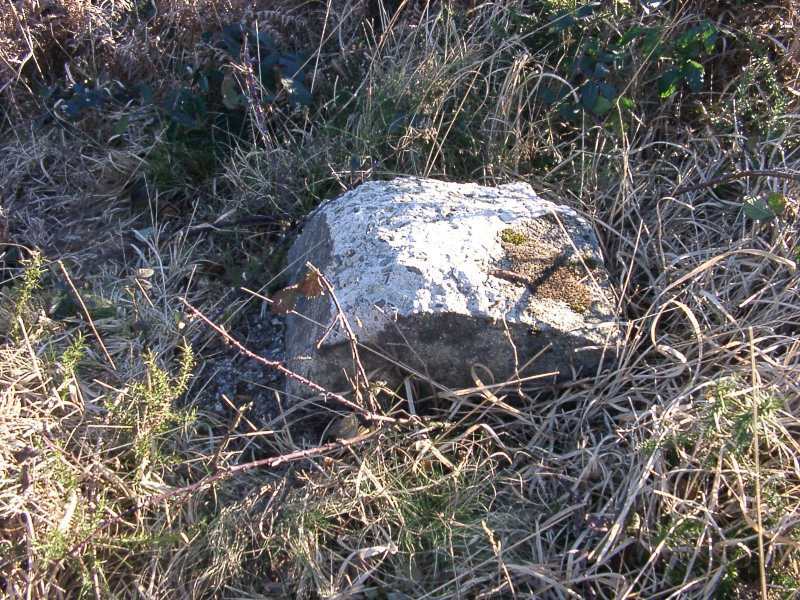 This has been badly damaged by the flail during scrub clearance. 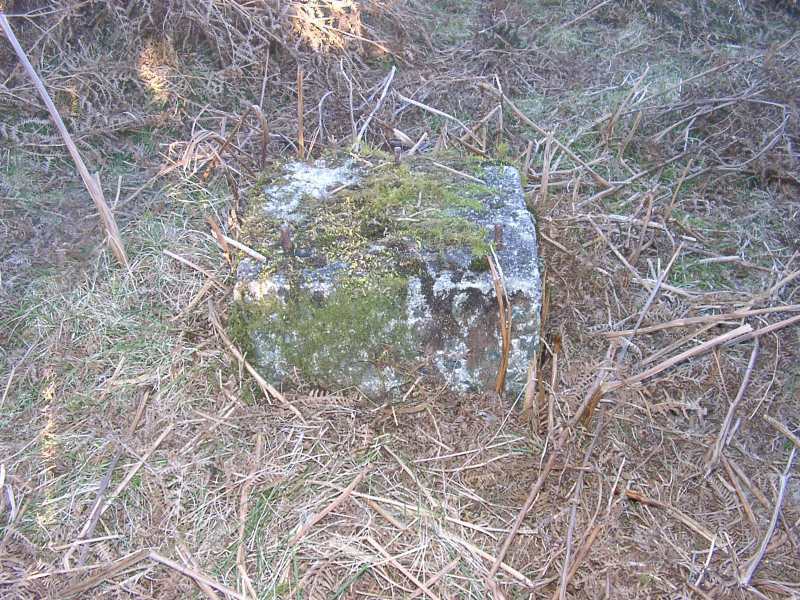 We thought this base had been lost under a car park but a further search found it hidden under another gorse bush! Finally revealed after a fire! It's annoying how you can search and search for a base and then suddenly just stumble across it! 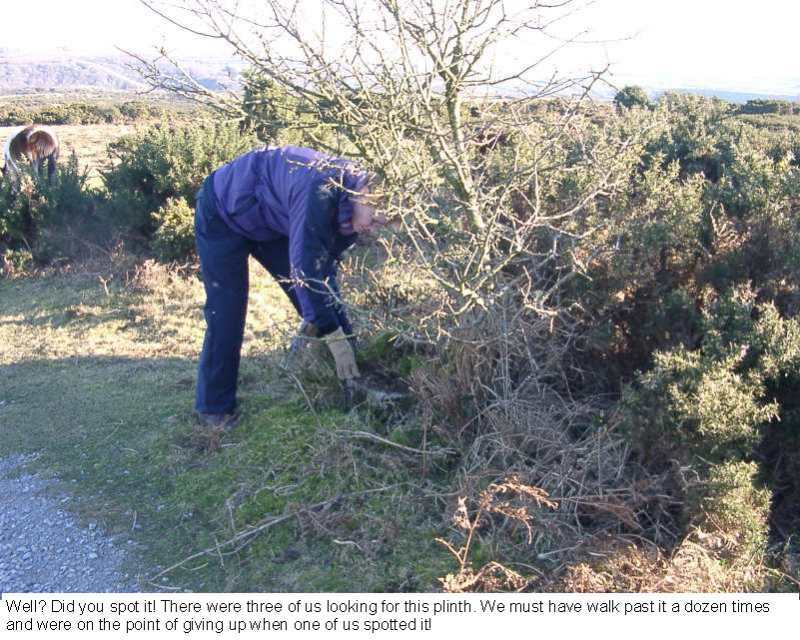 Hidden inside a gorse bush! Right alongside the A386 and visible from the road! On the left, looking from No 20 to No 19 (right-hand figure is standing on the Base). On the right, looking the other way to No 21 (circled). Note the clearly defined mark along the ground showing where (possibly) the power cable was buried. Dr Bentley tells us he found this in the corner of a field. Well we haven't relocated it yet! Despite looking - but you look for hours and then trip over them! 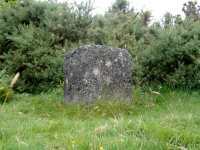 There is another plinth like this near the Car Park on the edge of the Moor. We found that one but haven't got a photo yet! in an area which has been cleared by flailing. The need to construct decoy airfields in the South West became urgent in July 1940. In a letter to the Air Officer Commanding in Chief, dated 22 July 1940, Colonel John Turner (the senior air ministry person in charge of deception) wrote, "I would remind you that at present practically the whole of our attention is concentrated on finding sites in the south west for 'Q' lighting (fake runway lighting) and dummy fires........ We have to add something like forty sites and forty dummy fires in the shortest possible time." On 7th December 1940, the Admiralty requested proposals for decoy sites for Plymouth. A local conference was held on 9th December and plans were forwarded to the Secretary of the Admiralty on 18th December 1940. 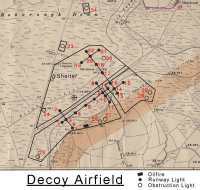 In respect of the decoy airfield, two potential sites had been identified and a site to the east of Roborough Aerodrome was favoured. Commander W Blunt RN assessed the two sites. He wrote to the Director of the Local Defence Division, Admiralty, "On arrival at Roborough, I was flown over both the site decided upon at the conference and another, which was originally proposed. The former, which lay to the eastward of Roborough Aerodrome, was partly in a wood and partly in fields. Obstruction lights were to be placed across a valley containing a river and a railway line; a certain amount of wood would have to be felled and some of the lights would have to be erected above the surrounding trees. 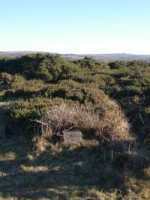 The latter site was on Roborough Down, about three miles to the northward of the parent aerodrome. This site was covered with bracken and gorse, and partly a golf course. From the air there was no comparison as to which might possibly be mistaken for an aerodrome. An experienced officer in the RAF considered that even on a moonlight(sic) night, and possibly if flares were used, a dummy aerodrome laid out here might be mistaken for the real thing. In addition, the site was about half way between the new aerodrome at Crapstone and Roborough aerodrome, and would therefore serve as a dummy for either. It was decided that Roborough Down was undoubtedly the better site and would be submitted for approval." This letter is important because although it acknowledges that although the parent aerodrome for the decoy would be Roborough, it would also serve as the dummy airfield for RAF Harrowbeer. The fact that part of the golf course encroached on the site was initially of concern, until it was realised that at nighttime the fairways might look like runways. In a letter of 21st December 1940 it was noted, "It may be possible to modify the line of the fence so as to encroach on fewer fairways, but the greatest point of interest about the fairways is that those involved within the area could be developed to simulate landing runways. It is considered that the site will lend itself also to the making of dummy runways along the line of the flarepaths, and that in view of the enemies(sic) increased use of illuminants at night, these additions should be put into effect and so help to preserve the dummy appearance of the site under all conditions. Expert advice will however be necessary as to the practicability and execution of this plan and as to what other measures to heighten the illusion, might be desirable." The decoy airfield was therefore constructed on Roborough Down in the spring of 1941. The Air Ministry provided the runway lighting and two 2.5KW generators - all other materials were sourced locally. 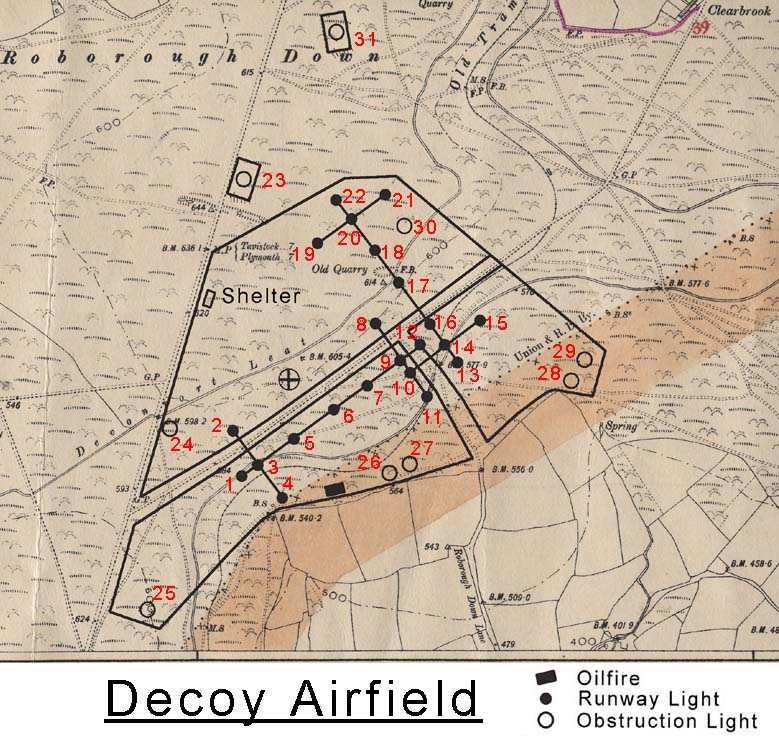 The Air Ministry files contained three drawings of the decoy airfield, of which the map on the website is the latest and therefore, presumably, most authentic version. The circle with the cross inside, which I had previously thought may have been a recognition light, to warn off friendly aircraft, was in fact simply the spot at which the map reference for the site was taken. Recognition lights were apparently abandoned fairly early in decoy development in favour of switching off the runway lights if an allied aircraft attempted to land!!! The decoy airfield on Roborough Down, coded PL2, was probably established in the spring of 1941. It was one of ten night time naval decoy sites, codes PL1 to PL10, set up around Plymouth by the Admiralty to attract enemy action away from the city and dockyard. PL2 was the only decoy airfield, the other sites imitating city lights and fires. The decoy airfield is located south west of Clearbrook and is adjacent to the southern boundary of the VHF transmitting and DF homing site for RAF Harrowbeer. 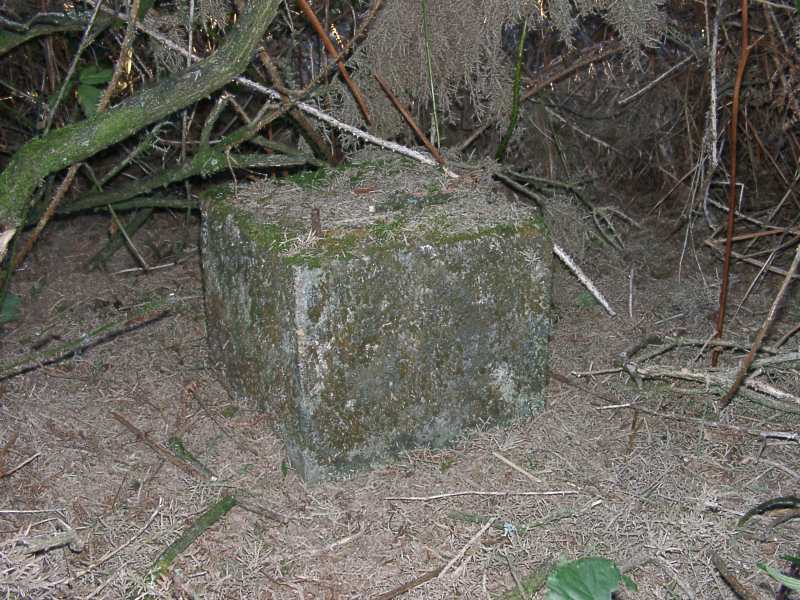 Since the object of the decoy airfield was to encourage enemy aircraft to unload their bombs on the decoy site rather than the parent site it was important that the sites were situated both on the expected line of approach and away from centres of population. 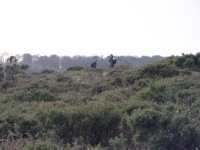 As an area of rough heathland north of the city, Roborough Down was ideal. 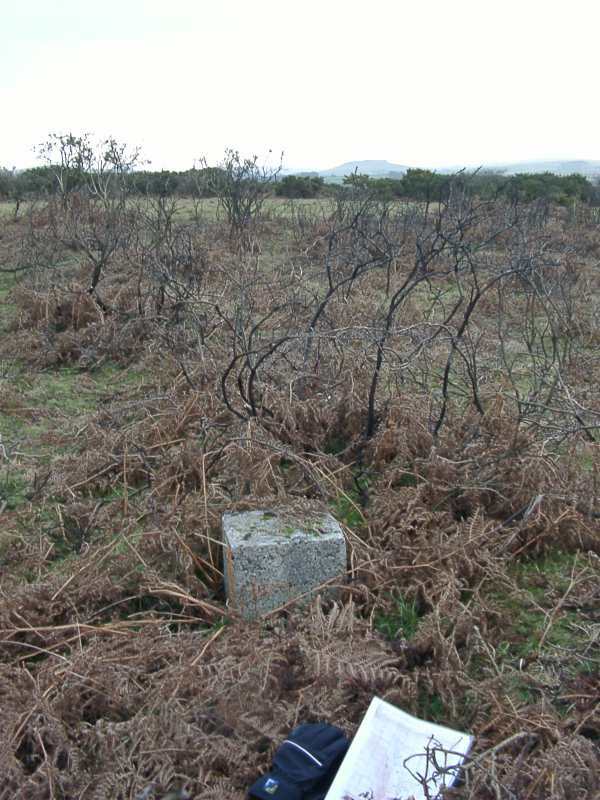 The PL2 decoy was designated as a Q/QF site  Q indicated that the site imitated night time airfield lighting and QF indicated the presence of an oil fire. The runway lights were electric lamps replicating the full lighting of a genuine airfield. At the end of each runway was a set of yellow lights imitating an airfield T shaped wind direction indicator. The pilot flew into the wind along the long line of the T in the direction of the junction. The decoy site had four wind T patterns, which could be switched according to the wind direction. These are clearly identifiable on the map. Around the decoy site were placed red obstruction lights of the type used to mark tall building and other flying hazards. At PL2 these were mounted on concrete plinths, approximately 60 cms in height. 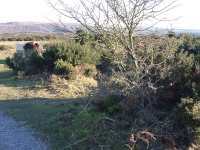 The site may also have been equipped with a single recognition light, which could be switched to flash green and yellow if an RAF pilot mistakenly attempted to land. 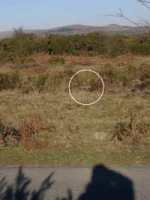 This device may be the object marked on the map as a circle with a cross inside, but currently this remains unconfirmed. The decoy airfield was equipped with an oil fire. This is likely to have consisted of a series of flare cans located underneath a long basket grid filled with coal. Once ignited, creosote, supplied from a tank mounted just over ten metres away on a scaffold tower, was dripped on to the burning coal to create spluttering flames and a lot of smoke. The fire would be ignited after the first wave of bombers had passed to encourage further waves to believe that a target had been hit and to release their bombs in the same area. 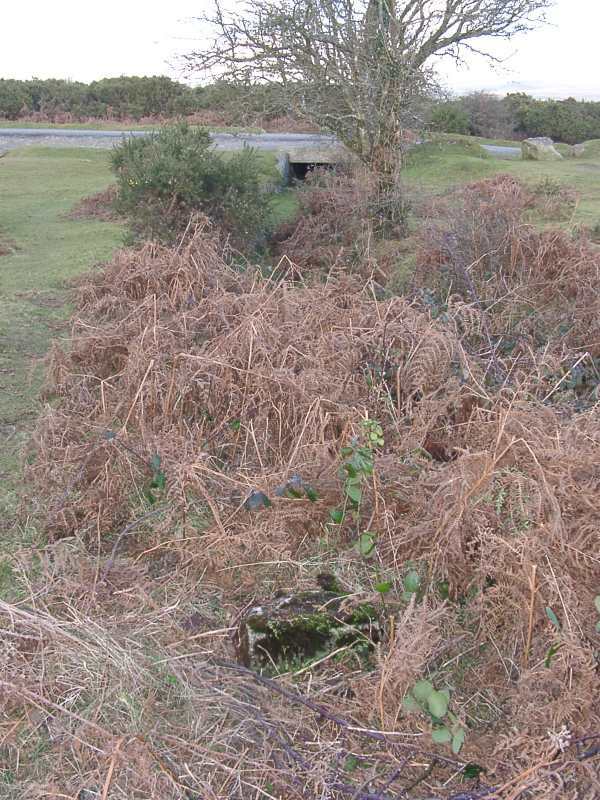 The decoy site was operated from a shelter in a safe position on the edge of the site by a crew of two. The shelter housed an electrical generator for the lights and a switch room with a telephone link to the parent site. 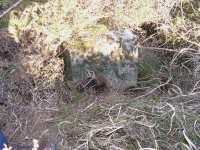 The shelter may have been underground or earth covered for camouflage. Once a communication had been received from operations staff at the parent site the decoy lights were switched on. One of the crew would act as an observer. A car headlamp mounted on a gantry next to the shelter and angled slightly above the horizon was very slowly moved in an arc to give the appearance of an aircraft taxiing. This lamp could be seen from the air over a distance of five miles. The obstruction lights would then be extinguished but the 'T' flare path left on, exactly as would be the practice, for safety reasons, during a sudden raid on the parent site. If a second wave was expected a decision might be made to light the oil fire, to create the appearance of a successful strike. Any bomb craters would subsequently be filled in to preserve a daytime appearance of normality. On 4 October 1944, the Admiralty took the decision to scrap all of the Plymouth decoys. At the PL2 site, to maintain secrecy the lights, generators, switchgear, shelter fittings and any above ground wiring are likely to have been removed to a regional store. 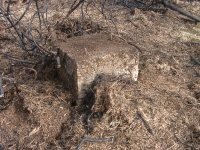 The fuel from the oil fire site would be salvaged, but incinerated debris was probably scattered (At the Woodbury QF site for RAF Exeter, clinker can be found on the ground identifying the site. 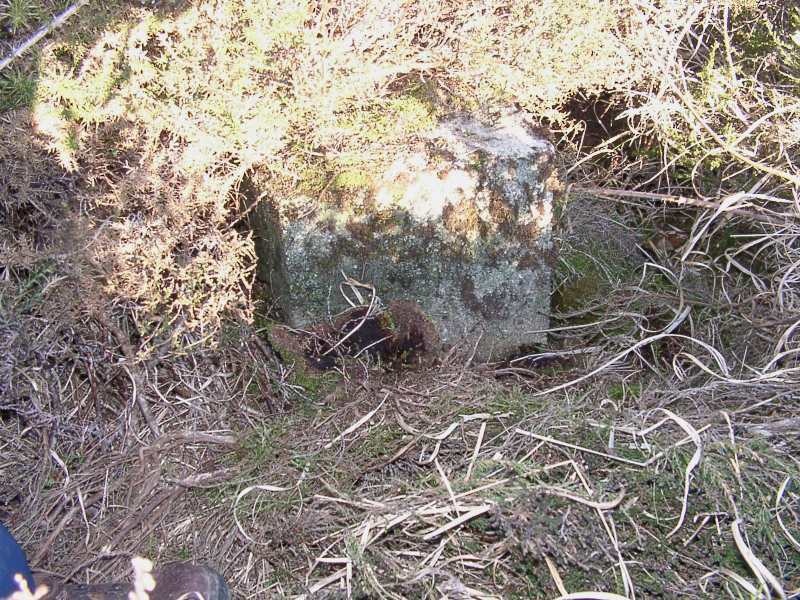 It is possible that similar clues await discovery at this site). At all costs the nature and purpose of the decoy sites were to be kept secret. The official papers describing many of the deceptions remained classified until the spring of 1978, thirty three years after hostilities had ceased! The position of the shelter on the western boundary of the site is indicated today by a few scattered bricks and pieces of concrete. 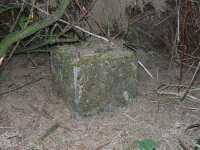 Concrete runway lamp bases and a concrete obstruction light plinth have been found in situ. It is possible that some of the below ground wiring also remains in place.